Rushing Life: Urgent, Urgent... Emergency!!! For as long as I can remember, I heard the tidbit of info that you should never lift a baby/toddler by their hands, for risk of dislocating their arm. Well, turns out that isn't just an old wive's tale. On a Wednesday night, before putting Bimmer to bed, I laid down on the living room floor to do my crunches/planks/leg raises. Bimmer normally lays next to me and does them with me, which is so stinkin' adorable. But on this particular night, she felt compelled to sit on top of me. Puff eventually pulled her up and she was NOT happy. So not happy that he was holding her hand to keep her from trying to climb back on top of me. Which lead to a twist, pull, and full-body slam on the floor... All while Puff was still holding her hand. Of course she started to cry harder and wanted me to hold her. Puff started off with his "I hope you did hurt yourself" and "That's what you get for not listening" rant. Within about 10 seconds, I could tell something wasn't right. As Puff tried to turn on TV shows to watch, I was focusing on the baby. She was grabbing her right elbow and couldn't stop crying. I eventually was able to convince Puff that she was honestly hurt. I kept trying to stretch it out to see if that hurt worse. (It did.) And then was looking for swelling. Since I didn't know what else to do, I put ice on it. 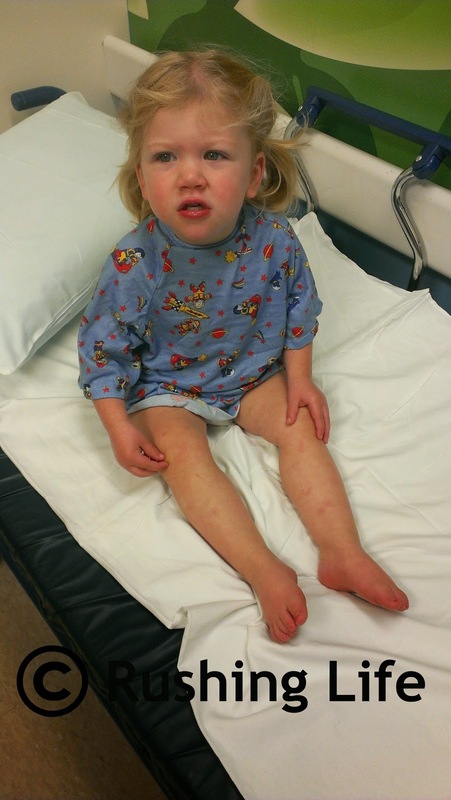 After about 10 minutes, we called her pediatrician, who immediately diagnosed her with "nursemaid's elbow." She assured us it was super common and easy to fix - but it would require a trip to the ER. Ya know... the ER we had just been to on the Sunday night that had just passed. Like, 3 nights earlier. That visit had been at 2am for a horrible cough that just didn't sound right and Bimmer not being able to catch her breath after each coughing fit. 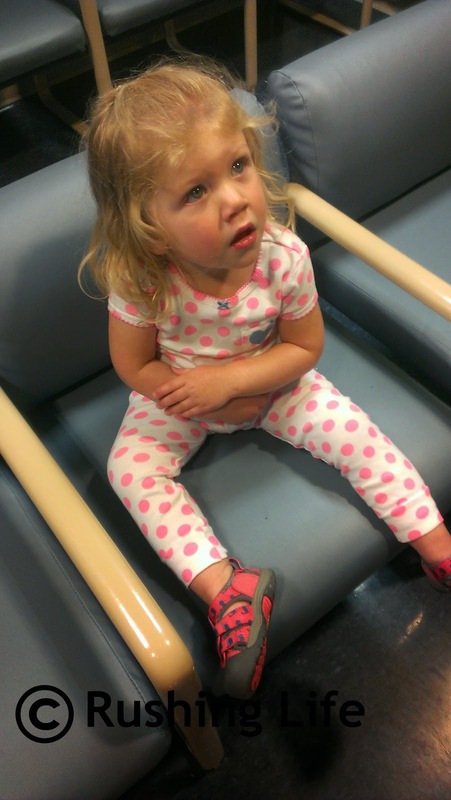 Turns out she had croup. A little shot of steroid remedied that issue. Thankfully I was then able to rest a bit easier. Ya know, as easy as you can rest when your child sounds like she is having trouble breathing. Right... so back to Wednesday night. We saw a nurse who immediately agreed with our pediatrician's phone diagnosis, and then a resident, who had Bimmer stretch out her arm, twisted it a bit, and popped it right back into place. Bimmer jumped a bit and let out a bit of a shocked wail, but that was that. The doc made her use it immediately by picking up a remote control and then keys with it. Once she realized there wasn't any pain when she moved, she was back to normal. I will give a nice big ol' shout out to our local ER. The hospital is only a few minutes from our house, but they have a separate pediatric waiting room (which is soooo nice once you see the characters that hang out at night in the ER waiting room) and both times, we were in and out and back home in under 90 minutes. That said, here's hoping we don't find ourselves back there again any time soon!